Wouldn’t you like to show your friends how beautiful the underwater world is? If so, this course is the right one for you! By taking the PADI Digital Underwater Photography specialty course you’ll soon be making pictures like the pros. And you’ll also learn to process your photos on the computer. 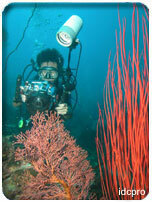 The course materials include the new PADI Digital Underwater Photographer Manual and an underwater white-balance slate. For advice regarding specialties, contact us at info@godiving-malaysia.com or call/sms +6019 3823172 remembering that you would have taken certain specialty dives already in your PADI advanced open water course.